At ESO headquarters in Munich. I went for a walk while John was in a meeting. February 2018 and I'm at the Konkoly Observatory in Budapest for an OPTICON exective meeting. As you can see, it was quite wintery. The first Common TAC meeting of 2018 was in Aarhus, which is in northern Denmark. It provided a long awaited opportunity to visit the Danish collection of historic aircraft and the Danish Air Force exhibition at Stauning. The PBY Catalina which is there I had seen some years ago in Elsinor. In Brussels heading for the OPTICON mid-term review meeting in October 2018. This is the harbour fortress at Heraklion, in Crete. The OPTICON board meeting was at a nearby institure called 'FORTH', but they didn't have a bridge I noticed. More Pictures of Mr McNoceros? 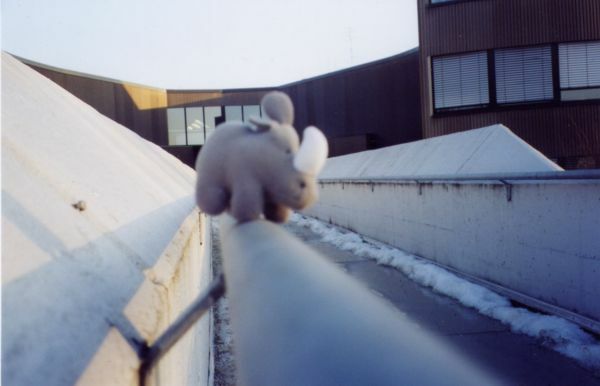 No Rhinoceros were harmed during the filming of the web-page.